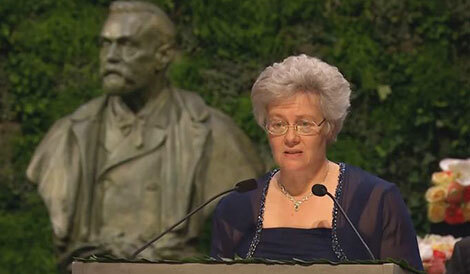 Professor Anne L’Huillier delivering the Presentation Speech for the 2014 Nobel Prize in Physics at the Stockholm Concert Hall. When our ancestors learned to master the fire about 300,000 years ago, they used it not only as a source of heat or as a weapon against wild animals. The fire shined in the dark when all other lights had gone out. In the late 19th century, the American inventor Thomas Edison was able to improve the incandescent light bulb to make it usable. It has been said that it took him around 2,000 experiments to succeed. When people said that he had failed, he replied, “No, I have not failed. I have found two thousand ways not to make a light bulb.” As the electrical power grid expanded and the light bulb improved, millions and soon billions of people gained a cheap and sustainable source of lighting. The light bulb shined in the dark when all other lights had gone out. After the Second World War, electronics based on semiconductor materials was developed. Scientists discovered at an early stage that certain combinations of semiconductor materials, diodes, could emit light. In a light bulb, a filament is heated so that it begins to shine. Light emitting diodes transform electricity directly into light and are therefore more efficient than light bulbs. In Europe, they were called crystal lamps, since they are made of crystals. In the United States, they were called LEDs. The first LEDs emitted red light. Soon afterward came LEDs that emitted green light. If you mix red, green and blue light, you get white. Creating white light sources also required blue LEDs. From the 1960s, industry and universities invested a lot of effort to create blue LEDs, but the necessary gallium nitride crystals turned into a powder. Many researchers tried, failed and gave up. In the early 1970s, a new technique for growing gallium nitride crystals was developed. This led to new research efforts, new experiments and new failures. It was simply too difficult. Isamu Akasaki and his PhD student Hiroshi Amano at Nagoya University in Japan, as well as Shuji Nakamura, then researcher at a small company in Tokushima, succeeded where all others had given up. After several years of hard work in the late 1980s – with great persistence, skill and perhaps a bit of luck – they were able to produce fine gallium nitride crystals and give them the properties needed for efficient light emission. 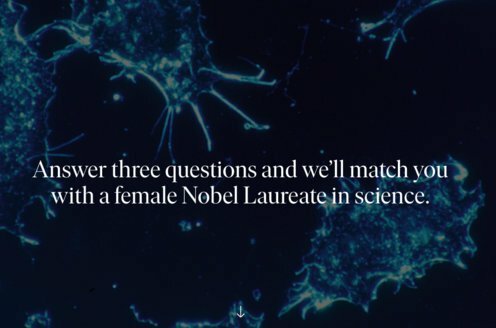 The Laureates certainly performed a lot more than 2,000 experiments, and they found many ways not to make a blue LED. But they succeeded in the end. Thanks to the blue light emitting diode, it became possible to produce white lamps. Today these are everywhere – in our mobile telephones, our bicycles, our cars, our cities and our homes. By using an LED lamp for lighting instead of an incandescent light bulb or a fluorescent lamp, we save energy and thereby protect the environment. An LED lamp also has an incredibly long lifetime: approximately 100,000 hours, or about 11 years. Since it is so efficient, it can shine for many hours using the electricity from a battery, which can be charged using sunlight. LED lamps light up places on earth where there is no electrical power grid. They shine in the dark, when all other lights have gone out. More than a century ago, Alfred Nobel wrote in his will that the Nobel Prize in Physics should be awarded to those who shall have conferred the greatest benefit to mankind. This year’s prize fulfils Alfred Nobel’s wish extremely well. You have been awarded the 2014 Nobel Prize in Physics for your invention of efficient blue light emitting diodes, which has enabled bright and energysaving white light sources. On behalf of the Royal Swedish Academy of Sciences, it is my honour and pleasure to convey to you the warmest congratulations for your outstanding work. I now ask you to step forward to receive your Nobel Prizes from the hand of His Majesty the King.